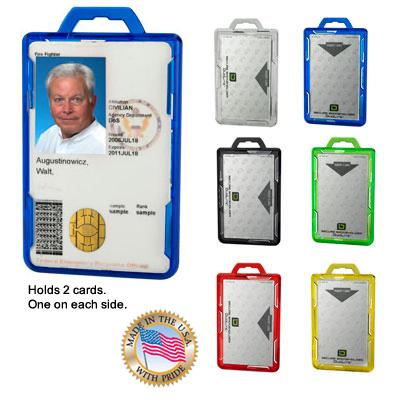 Shields ISO 14443/15693 and EPC Gen 1/Gen 2 contactless smart cards and RFID tags (MIFARE, iClass - will not shield 125 khz cards such as the ProxCard, ISOProx,DuoProx,Prox-Linc. Our Secure Badgeholders are made of extremely durable polycarbonate. 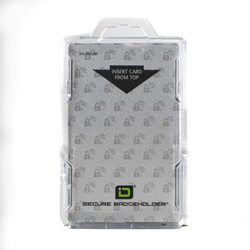 The state of the art unique open face design keeps cards locked in to prevent loss, yet allows easy access to remove them when neccessary. Other holders on the market cover the face of the card, keeping debris and liquid trapped inside which can damage the card. Closed holders also make removing the card for reading and displaying difficult.